Those voters that voted for Obama will vote for Hillary, there are very few that care anything other than she is a democrat and will (or so they believe) push through their agenda. The vast majority of democrat voters do not care that she is a rich 1%er, which they claim to despise. They don't care that we lost Ambassador Stevens on her watch. They wont care about her age, the numerous women of Bill's improprieties that she personally destroyed. THEY DON'T CARE, they will vote for her anyway. Almost a full 50% of the voting public are so devoted to vote for a democrat that they have already elected Obama, who is and was at the time so unqualified and under qualified for the position it defies logic. Hillary is almost a shoe in, and the democrat machine are recruiting more and more democrat voters by any means possible to make up for the few that they lose when they come to their senses. Just look at the push to get ex-felons to vote, the amnesty programs and so on. The fact that Hillary is a viable candidate for the democrat party is so unconscionable to anyone that is smarter than a rock is the ultimate proof that the electorate has been corrupted beyond repair. The short version is WE AREN'T VOTING OUR WAY OUT OF THIS! Good Luck and G_d Speed. E.
Jun 02, 2015 · More people have an unfavorable view of Democratic front-runner HillaryClinton now than at any time since 2001, according to a new CNN/ORC poll. According to a CNN/ORC poll, 50 percent view Clinton unfavorably — up from 44 percent in March (before she announced her presidential bid) and the highest level since 2001, when it was 53 percent. 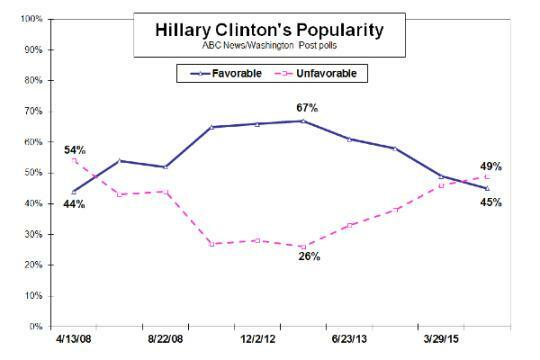 The only other time a majority of Americans viewed Clinton unfavorably was in 1996, when she was first lady. 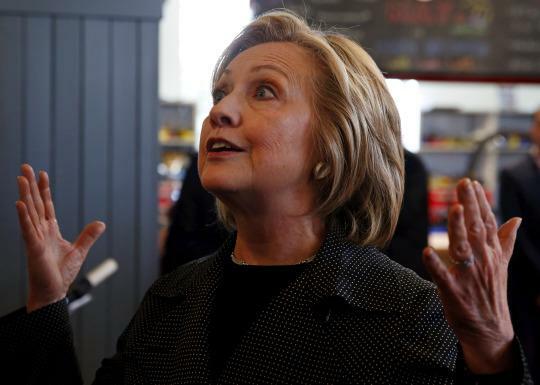 The survey found 46 percent view Clinton favorably, down from 53 percent in March and 61 percent in May 2013. Meanwhile, 57 percent of Americans say she is not honest and trustworthy (up from 49 percent in March), 47 percent feel she cares about people like them (down from 53 percent in July 2014) and 50 percent feel she does not inspire confidence (up from 42 percent in March 2014). 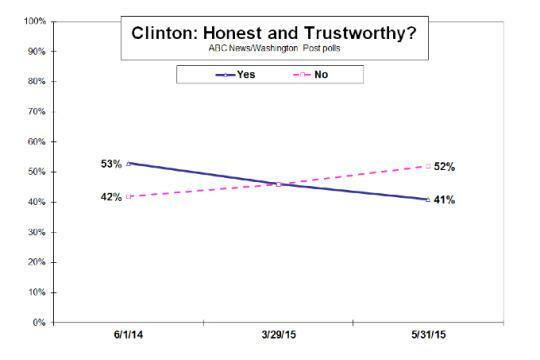 A new ABC News/Washington Post poll shows Clinton faces similar character hurdles. Just 45 percent view Clinton favorably — down 22 percent since January 2013, at the end of her tenure as secretary of state. And more people (49 percent) view her unfavorably than favorably for the first time since 2008, when she ran for president, losing in the Democratic primary. While the increasing distrust and unfavorable view of Clinton can be attributed in part to perceptions of her by Republican and independent respondents, it can’t be attributed entirely to those respondents. According to the ABC/Washington Post poll, 36 percent of independents and 14 percent of Republicans view her favorably. Yet “even among those who intend to vote for her in the Democratic primary, just 78 percent see Clinton as trustworthy,” writes Gary Langer of Langer Research Associates, which conducted the poll. May 03, 2014 · Hillary Clinton should be worried as Benghazi coverup unravels. ... this scandal is no garden-variety cover-up. And despite Hillary Clinton’s fervent ..
ShapeFast Ultra has DR.OZ's Recommended Weight Loss - FORSKOLIN! Taliban Five Set For June 1 Release. Was It Worth It? A 7.3-magnitude earthquake hit Nepal on Tuesday, killing dozens of people and triggering renewed panic on the devastated streets of Kathmandu. The temblor came less than three weeks after 8,000 people died when a 7.8-magnitude quake rocked the Himalayan country on April 25. "It was completely unexpected," 21-year-old nursing student Shristi Mainali told NBC News from Kathmandu. "At first we just felt like a shake, and we thought it was normal, we are having aftershock, but it didn't stop, so we got up and rushed to our garden. We could see the ground moving, shaking … in that moment you cannot differentiate whether it's the ground is shaking or it's your legs shaking." A fresh earthquake measuring 7.3 magnitude hits Nepal, killing more than two dozen people, as buildings weakened by last month's devastating quake are brought down. Chautara, Nepal: A second powerful earthquake in less than three weeks spread panic in Nepal on Tuesday, bringing down buildings weakened by the first disaster and killing at least 66 people, including 17 in neighbouring India and one in Chinese Tibet. Most of the reported fatalities were in villages and towns east of Kathmandu, only just beginning to pick up the pieces from the April 25 quake that left more than 8000 dead. The US military's Pacific Command said a Marine Corps helicopter involved in disaster relief had gone missing, with six US Marines and two Nepalese soldiers aboard. The new 7.3-magnitude quake was centred 76 km east of the capital in a hilly area close to the border with Tibet, according to coordinates provided by the US Geological Survey, and unleashed landslides in Himalayan valleys near Mount Everest. In the town of Sangachowk, residents were outside receiving government food aid when the new quake struck. A family sat on the edge of the road where their house had just fallen down the hill, rubble spread over hundreds of feet below. "We watched it go down slowly, slowly," said Ashok Parajuli, aged 30. In Charikot, where at least 20 bodies were recovered, hotel owner Top Thapa said the quake was at least as strong as last month.